Why only a fashionable multifunctional USD adapter is enough? 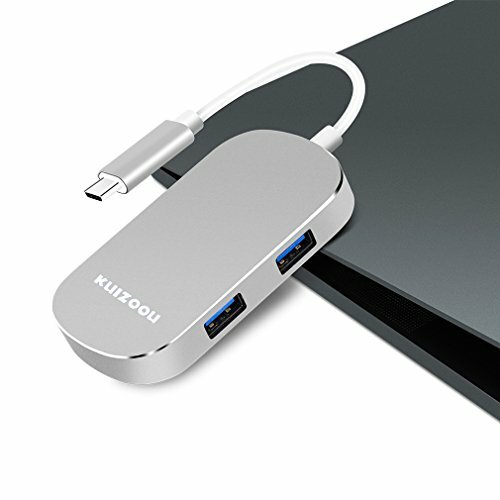 USB Type-C hub provides functions that needed for realizing various ports, KUIZOOU K-01 aluminium Pro Hub is our latest product in USB Type-C series in 2017. It is a perfect partner for MacBook Pro and latest computer with USB C port. The adapter is with 5 ports, including 3 USB 3.0 ports, 1 4k HDMI and 1 Type-C port. HDMI output enables HD display of your laptop to any TV sets or monitors by using HDMI port. With ability of combining 4K resolution video and audio output and charging your laptop at the same time, it can change your desktop life!!! 1. HDMI: extend your screen with the USB C Hub HDMI port to HDTV, monitor or projector. It provides simple plug and play connection of HD monitor or TV set and supports resolution up to 1080P, 2K, 4K (3840 * 2160@30Hz). HDMI port can change to VGA port by connecting HDMI port with VGA adaptor. 2. Type-C adapter is a kind of multifunctional high performance design, which connects your laptop via Type-C charging port, and obtains power and data transmission at the same time. 3. 3 USB 3.0 ports: connects external hard disk drive (supporting 1 of 2.5 inch only), thumb driver, camera, printer, scanner, tablet PC, mobile phone and used equipment, keyboard, mouse to Type-C device. Data transmission by USB C device is limited, when the voltage of computer is overloaded, it may cause system breakdown, so it is not suggested to use several USB at the same time for big data transmission. 4.Easy for carry: fashionable and simple design ensures adapter can be carried as easily as laptop. Just put it into laptop bag or suitcase. It can save your time to find the adapter soonest. By using the adapter, it can be a good help for you when you enter into any meeting room before giving a lecture, and makes you leave a good impression to others. Plug and play extending: USB-C hub with charging port, 1 HDMI port and 3 USB 3.0 ports. It is a multifunctional USB-C device, which doesn't require any software, driver or complicated installation process. Power Delivery: it can work while charging and can also connect to several ancillary equipment and transmit data. Meanwhile, it can simultaneously load several devices. 4K Video Adapter: extend your screen with USB C Hub HDMI port and directly stream 4K HD or Full HD 1080p video to HDTV, monitor or projector and other devices. USB 3.0 port: support USB keyboard, mouse, thumb drives to connect to Type-C device, and support MacBook Pro and other laptops with USB-C port. Fashionable design: high-standard integrated aluminium appearance, with intensified TPE cable coating and EMI protection for interference prevention of wireless device. If you have any questions about this product by KUIZOOU, contact us by completing and submitting the form below. If you are looking for a specif part number, please include it with your message.